The CAC is pleased to announce the launch of a brand new bookstore platform. Simply follow the CAC ONLINE BOOKSTORE link to create your new account. If you are a CAC Sponsor or co-hosting a training with a CAC Sponsor, it is critical that you indicate that on your training authorization form in order to gain access to the special CAC Sponsor pricing. You will not have access to CAC Sponsor pricing until you submit a completed training authorization form to the CAC Executive Director, Tracey Kohler, at tkohler@compressedairchallenge.org. CAC's Best Practices for Compressed Air Systems Manual (BPM) – available on AMAZON and in LOGO EDITIONS! 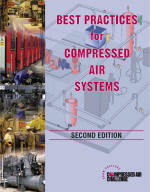 If you are interested in purchasing The Best Practices for Compressed Air Systems Manual - Second Edition only, you can purchase it directly from Amazon using the link below. In addition, if you are interested in co-branding the BPM, you can do so and receive a discount on bulk orders. Discounts outlined below. BPM Logo Edition Discount Options – Co-Brand the BPM Today! If you are interested in co-branding the BPM with your logo, please contact tkohler@compressedairchallenge.org.